We believe that our experience, knowledge and support will get the best results for our property owners. 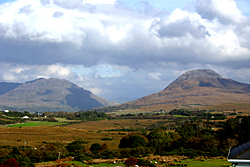 Connemara Coastal Cottages have been in business since 1995.The quality of our portfolio of properties is part of our success and our customers trust that quality to make their holiday one to remember. We are experienced having self catering experience of 35 years. We can provide expert local knowledge and service to your potential guests.We take great pride in our friendly and professional service to ensure we deliver returning guests to your property year on year. We are here to advise and help at all times and to assist in any way we can. We provide a walk in service to both cottage owners and potential guests. We can help reach your property maximum potential from advising prices to colours of curtains. We will assess your cottage prior to listing and provide recommendations to you. Annual administration fee is payable upon minimum number of bookings. Professional photographs to ensure your holiday property is equipped and well presented to the market. We take care of all booking details and payments from guests. Phone/email confirmation of a booking followed by monthly guest arrival reports. Just Email info@cccottages.ie or phone 00353(0)87 3696546 giving us some brief details and (some photos if possible) of your property and we will organise everything from there.